When patients presents with this complaint a full radiograph of the ankle / foot is required to help. 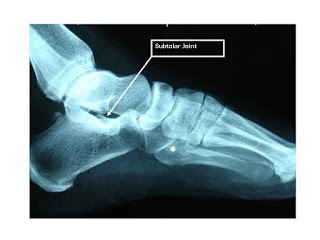 Surprisingly the pain is usually not in the ankle joint, but rather a very little talked about joint called the subtalar joint. 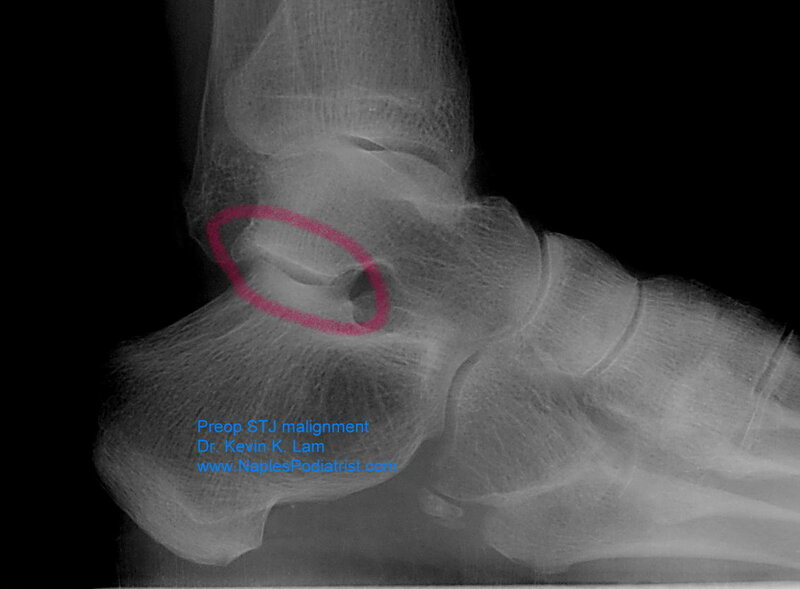 This joint is below the ankle joint in the foot. Testing for this is involves moving the foot in and out by grabbing the heel, called an inversion / eversion stress test. Clinical exam will review pain in the outside of the foot right underneath the small ankle bone, fibula. Subjective complaints from the patient can be burning, shooting pain and stiffness in the morning with difficulty with uneven surfaces. Case below is a 72 year old RN presents for second opinion on her ankle pain. 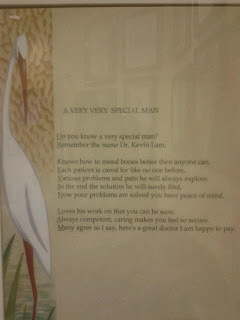 She has been to other doctors to no avail. Xray below was taken. Symptoms: Pain in the lateral foot below the ankle joint. Pain on uneven surfaces, stiffness and pain in the morning. Manual test shows pain upon inversion and eversion of the isolated joint. Patient did get immediate relief with 1% lidocaine into the subtalar joint. 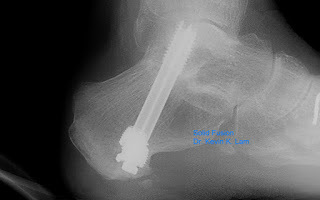 Above shows the post operative Xray of a healed subtalar joint fusion. Noted the joint is realigned now and that there is a boney bridge present. No pain per the patient and able to go about her activities as an RN at full duty. 8 wks of none weight bearing in a cast. Then a cam boot for 8 wks with aggressive physical therapy. Discussion: Degenerative joint disease of the subtalar joint can be treated with NSAIDS such as motrin, aleve, etc. Injection therapy with corticosteroids may be of help, but a dislocation as presented in this case requires a subtalar joint fusion or the pain and instability will continue on a daily basis. 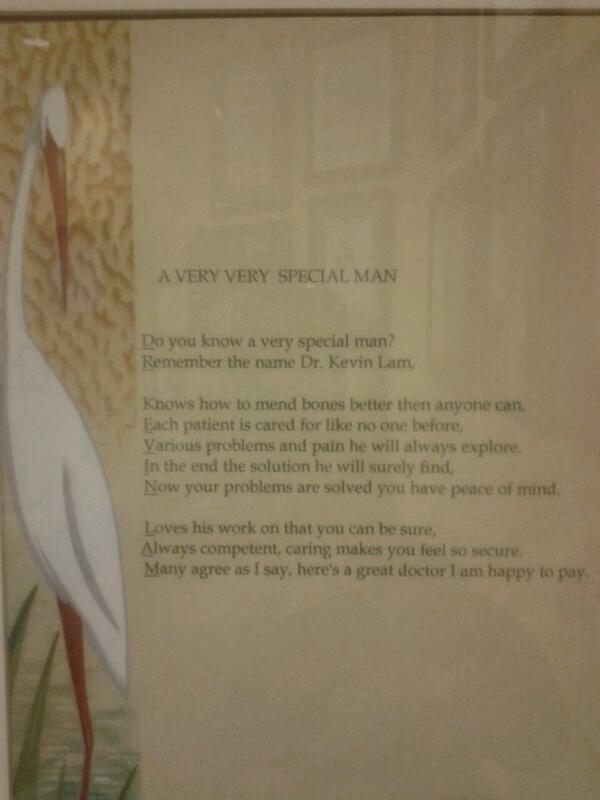 Below is a poem from a subtalar joint fusion patient. It is the reason that patients are advised not to walk on the uneven surfaces and if they get any type of ankle disjoint so go to Physiotherapy North Ryde fr better and early relief along with the medicines he is using because the sprain also needs the hands pf the therapist to be healed. There is a great chance of fall on an uneven surface and a lot of people just develop their knee pain Canberra due to the falls so now it is our prime duty to settle the problem in priority basis.